I like to try things out, and as my colleagues point out, I am one of the early adopters when it comes to new technology. I am a self-confessed Apple nerd, and here at //SEIBERT/MEDIA, I have worked actively to ensure that all our employees get MacBooks (if they wish). As we have become deeply involved with Google as a company, and we are now an official G Suite reseller, my openness towards alternatives to Apple has increased. My current self-experiment isn't the first where I put my established work tools to the test: Previously, an Android smartphone from Huawei almost succeeded in steering me away from the iPhone. So now it's the Google Pixelbook's turn to compete with my MacBook. I wrote down my experiences in chronological order - a Chromebook experiment diary. After removing the beautiful packaging and switching it on, I am immediately impressed by the high-quality keyboard. The keyboard of my MacBook is really bad. It's easy for the keyboard to be infiltrated grains of dust, and when you press R, two Rs come out. You can solve the problem with a powerful vacuum cleaner, but it's really annoying to have to do it all the time. Apple made a mistake with the hardware, in my opinion. I don't use the Apple MacBook Pro's touch bar at all. Of course I know that many people work do, and some know every time-saving trick, but here it should first be about my productivity. The only practical feature for me is the fingerprint recognition. Before I can really get started, I have to change my Google password to get into the Chromebook. Thanks to 1Password, passwords are so cryptic that you would never be able to remember them, even if your life depended on it. Google Hangouts Chat: We are using this as the corporate messenger at //SEIBERT/MEDIA. Telegram: We use this intensively with partners and customers, and I also use it privately with family and friends. There is a kind of "emulation mode" for websites where they look similar to programs. But you can only actually use the web interface. This is the case with Telegram, for example. After just ten minutes, I have already found so many aspects, and I suspect that the Chromebook will not be easy to introduce as a MacBook replacement. However: The Pixelbook is definitely better than a smartphone. And I can also imagine that you can really work properly with it. I'll keeping using it and see. Apps: A problem, or just a question of finding replacements? I'm not sure how to establish a VPN connection with the Pixelbook. But I can handle that relatively easily. Because we (as a company) have not purchased a device management license for Google Chromebooks, the administrators have to activate the installation of Android apps individually. This is very annoying and inefficient. However, further research quickly shows that the "guideline" can be easily circumvented by installing another private Google user in the Google Playstore, for whom the restrictions do not apply. With this, I can now install Android apps myself. This immediately solves two problems: With the OpenVPN app for Android, the VPN connection is quickly set up. And 1Password X was created for Chromebooks as a password manager. Both work well. Further testing gives me the impression that the Android apps are not quite as good as the native apps on the Mac. Or is this just a question of habit and adjustment? No, there are definite weak points. In Hangouts Chat, for example, the app doesn't offer me a layout for for the larger screen. I'm still looking for a text expander equivalent for the Chromebook. But I should be able to find one. Since the Pixelbook was imported from the USA, the keyboard is American. Even if the notebook itself does not have a German keyboard, you can easily switch the language input settings to be a German keyboard, and type away. Now I can hook it into my workplace properly. The USB C connectors are exactly the same as on the MacBook Pro and work in exactly the same way. The Chromebook supports multiple screens at the same time without problems. After about two hours of working with the device, I can't see any significant disadvantages when compared to a MacBook. The Football World Cup runs on one screen. On another one, I browse and write. On the third, various messengers are active. Drag & drop functions without problems. I can also easily save files locally on the device and continue to use them. Google Chrome is actually a fairly mature operating system. I'm not sure there's anything I'm missing right now. There is no lag or stuttering. That happens on my MacBook now and then because background apps seem to demand resources. I've replaced TextExpander on the Mac with the free Chrome extension Auto Text Expander. This was actually one of the most complex processes because I have 23 different snippets that I had to re-enter, one by one. However, snippet replacement only works in the Chrome browser and not in other apps. That's a little frustrating. Switching between two apps is easier on a Mac because the open app appear are shown on all screens. On the Chromebook this is only displayed on the current device. Hmm, didn't I just say above that I wasn't missing anything? Let me put it this way: Currently, the Google Pixelbook is more for people who know their way around or who have the patience to get involved with new apps, configurations and concepts. Then you can get a lot out of the device. For example, I like the concept of being able to turn tabs in Chrome into apps in the taskbar. It's just superficial, but it feels cool. I normally use getcloudapp.com for screenshots. Unfortunately, you can't use it on the Pixelbook. I'll have to search for something new so I can keep taking screenshots. Found it! This is already well solved in ChromeOS itself. You can also split screens with Chromecast. I must confess something: Such a Google Chromebook significantly increases your dependence on Google as a provider. On the other hand: Perhaps it's an advantage to know your Google password? On the hardware and accessories side, there are smaller hurdles to overcome here and there. A HDMI adapter that worked with the MacBook does not work with the Pixelbook. I have tested five different Apple and no-name adapters in our IT department. Three worked, two didn't. I'm using a different no-name adapter now. I continue to use my external keyboard and the same mouse as before. In this respect, the transition is relatively seamless. I'm only slightly restricted when writing on the Pixelbook itself - there are no umlauts. Someone who writes "fuer" instead of "für" in German always seems less than professional. I can easily handle that issue with an external German keyboard. If Google starts selling the Pixelbook in Germany, it will most certainly have a German keyboard. But I need some time to get used to the keys. On a Mac, you can press Alt + L for an @ sign. On Windows and the Chromebook it is the keyboard shortcut Alt Gr + Q. I find this a hard habit to change as a long-time Mac user. Windows users, on the other hand, should have no issues. I have noticed that there is a great deal of interest amongst my colleagues. Some see considerable potential savings when we don't have to purchase expensive Apple hardware. But I'm not sure if they are simply focused on the reduced costs, or if they really think they can work just as well with a Chromebook. I spent the whole day with the Google Pixelbook today. It's not the better device. And it doesn't increase my productivity. But it doesn't negatively affect me either. Unlocking your Macbook with an Apple Watch and the fingerprint sensor is an advantage. But not an overwhelmingly decisive one. Anyhow: I shall continue with my practical experiment. We held a live webinar session via YouTube. The video and audio are better than with the Mac. I was really impressed. The Pixelbook managed this without any problems and showed no weaknesses. Incredible! With Telegram, on the other hand, I can no longer copy messages easily. That's no so good. Anyway, I'm taking this to the extreme, and have decided work with only the Pixelbook for a three-day stay in Hamburg and leave the MacBook at home. Being "Convertible", i.e. 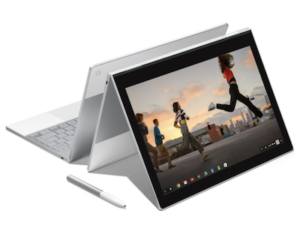 using the Pixelbook like an iPad, should be fantastic, especially on the plane - no more media breaks during take-off and landing. My experience is positive: even on the road the Pixelbook performs well. Connecting to my iPhone's hotspot and working via the VPN is easy. Working on the plane was great. Flight personnel allowed me to switch to tablet mode for takeoff and landing. When you switch from tablet mode to normal notebook mode, it takes some time to reactivate the keyboard. Selecting text in tablet mode is quite uncomfortable compared to an iPad. An advantage: You can work very well with the device in the dark; the keyboard is illuminated and looks to be high-quality. Always having to enter the password to unlock the computer is more tedious than on a Mac. A fingerprint scanner or maybe even a face recognition like the iPhone X would make my life easier. I'll have to check the settings again. Maybe you can also log in with a code. Aha! Tens of open Chrome tabs stretches the Pixelbook to its limits! I regret that my accessibility via Telegram on the Pixelbook suffers - also because there is no "unread" indicator directly on the app icon. Something I need to research: I can't quickly start a join.me session on the Chromebook. Is there a compatibility problem? Another hardware detail catches the eye: The Pixelbook has two USB-C ports, the MacBook Pro has four. Two is enough for me - but for some that may be too few. On the other hand, a single USB-C port as the new MacBook has is definitely not enough, as I have often noticed with colleagues. What always surprises me: Apple ensures that certain USB-C hardware does not function properly. Only Apple's charging cables charge reliably. Third-party HDMI adapters may not reliably work either. The MacBook Pro demands higher quality (aka more expensive) cables and adapters than the Pixelbook, perhaps by design? That's not an advantage for me as a user. After opening the MacBook again after about 14 days (mainly so the battery doesn't go flat), I notice once again what I don't like about the Mac: The eternal wait for automatic operating system updates has long become the norm. On the Pixelbook this is completely irrelevant. It just runs and you never have to wait. That's the way an operating system needs to be. Can I configure 'active' corners to see and switch to other active windows easily? Can I mirror an iPhone on the Chromebook for development, demonstrations and testing? How can I quickly take a screen shot on the Chromebook? I'm sure there will certainly further questions and challenges. I'll keep you updated!